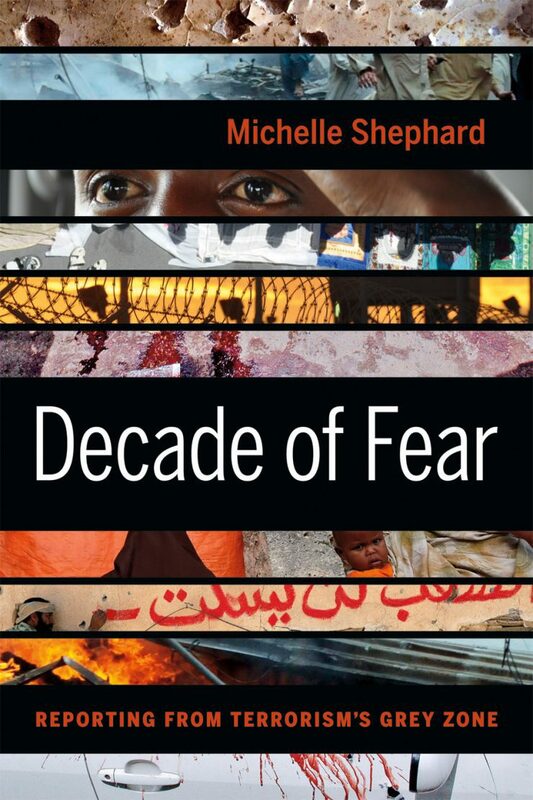 J-Source presents a two-part feature on Michelle Shephard's new book, Decade of Fear, an in-depth look at the evolution in terrorism reporting since 9/11. First, follow Alexandra Bosanac as she chats with the Toronto Star reporter at the Toronto launch party. Then, scroll on down for J-Source violence and trauma co-editor Jane Hawkes' fascinating Q&A about what it means to live the book's subtitle: Reporting from terrorism's grey zone. TORONTO//by Alexandra Bosanac — More than 200 colleagues, friends, family members and other well-wishers packed the Toronto Star lobby at the Sony Centre for Performing Arts for the launch of Star reporter Michelle Shephard's new book, The Decade of Fear. The 250-page book chronicles her experiences on the volatile terrorism and global security beat as well as her perspectives on the global events that followed the September 11 attacks. Not accustomed to being on the receiving-end of attention, Shephard took cover behind a post to sign copies. At the end of the night, all 130 copies brought by the publisher were sold and Shephard had a sore wrist from signing the vast majority of them. "It was incredible to see people from different parts of my life over the last 10 years," Shephard told J-Source. "I was joking that it felt like my wedding day over again." In writing the book, Shephard said she adopted a style she hoped would bring humanity to complex issues and make the topic accessible to readers. To keep the book as current as possible, she rewrote the final chapter three times. "What I tried to do is put in stories that I would tell my friends and family, the ones you can't always fit into the newspaper," she added. Shephard was working on the crime beat for the Toronto Star on the day of the towers were attacked in New York City. She left the newsroom soon after the first plane hit the north tower and drove with two other Star reporters to Manhattan to report from Ground Zero. Since then, she's reported from other hot spots: Yemen, Somalia, Pakistan and Guantanamo Bay. "I've been so lucky that the Star gave me this long leash to explore the beat,” she said, “They've allowed me to travel and define the beat of national security and what it includes." Up until that point, she added, such a beat did not exist: It was the day the world changed. "Ten years is a long time to stick with one topic but nothing else interested me at the time ,” Shephard said, “Because the Star was so supportive I've never been bored of the topic." Attendees included Shephard's editor, Lynn McAuley, her husband, photographer Jim Rankin, Star publisher John Honderich and editor-in-chief Michael Cooke, who apparently picked up the bar tab when the party moved to a bar down the street. At one point, Shephard, addressed the large and enthusiastic crowd as she teetered on a white leather chair, wearing high heels, giving shout-outs to the people who helped her formulate the book, including her parents, both former English teachers. J-Source's Jane Hawkes asked Michelle Shephard a few questions about how the coverage of terrorism has evolved over the last ten years and what impact her reporting has had on her personally. Jane Hawkes: You call your book "A Decade of Fear" – a decade beginning with the attacks on 9/11/2001. Fear, of course, is the terrorist's objective. Looking back over these ten years, what do you conclude about the West's response? Has it made the world any safer in your view? Michelle Shephard: We’re definitely more divided than we were ten years ago. It’s remarkable to think back to those weeks directly following 9/11, when there was incredible unity – shared pain and horror. In the decade since we’ve had two wars, tens of thousands of civilian deaths, a wounded military community, scandals such as Abu Ghraib that were gifts for al Qaeda propagandists, billions spent … what was once sympathy for the U.S. morphed into unprecedented anti-American sentiments in certain parts of the world. It is true that we have not had a major attack on North American soil, or one that has been as big as 9/11, but I don’t feel it is a safer world. JH: A good deal of your book is about process and the difficulty of reporting well in this climate. You write about journalists avoiding reality by writing about it and acknowledge the toll this type of reporting can take. From your ringside seat, how do you reckon the media in general have been doing? MS: It’s so important as journalists to remain as detached as possible to report objectively – and, as I’ve learned, this is almost impossible. Best I’ve tried to do is go into every story with a completely open mind and to challenge everything someone tells me. I feel very lucky that I’ve had such support and freedom from the Star to define this beat over the last decade. It has allowed me to be in places such as Somalia, Yemen or Pakistan before the world’s attention focuses on such regions in a time of crisis – which is often the hardest time to be on the ground. I also feel pretty lucky to have emerged without the emotional (or physical) battle scars some of my friends have come home with. I was never a “war correspondent” so I didn’t see the horrors they have in Iraq or Afghanistan. In the past year I’ve been helping with a documentary on PTSD among journalists based on the excellent book, Dangerous Lives: War and the Men and Women Who Report It, by Dr. Anthony Feinstein. It has really brought the issue home and I think media outlets need to be aware what a problem this can be and ensure journalists are well-cared for, just as we’ve discovered is needed in the military community. JH: There's a wealth of ambiguity in the story of these ten years. Pakistan's role, for instance – at the same time nurturing jihad and taking American aid intended to fight it – or the politics and the hard realities that forced President Obama to back off his promise to close the camp at Guantanamo Bay. So, lots of grey between the black and the white. Is that generally getting across, do you think? MS: That’s what I was trying to get at in the title with a play on the ‘grey zone’ and why I wanted to write the book in the first place. The short answer is, unfortunately, no. I don’t think we’re there yet, but we’re certainly much further than we were in the days of Bush pronouncements such as “Either you are with us, or you are with the terrorists.” Sure, it’s easier and tidy to think of the world in terms of good-guys vs. bad-guys and basic black and white terms, but it is this dangerous vilification of the “other” that has divided the world in such a dangerous way. Fear does that to people and we need brave politicians and non-sensational media to rise above the rhetoric. JH: When it comes to dealing with home-grown terrorism, you say the key seems to be figuring out how to control the narrative. What do you mean by that – and what does it mean for us as journalists? MS: I really think this idea of the narrative is important and we need to figure out why young, disenfranchised Muslim youths have been seduced by the ideology espoused by the likes of (U.S.-born Yemeni preacher) Anwar al Awlaki. The job for them has been too easy in the past when handed such material as the Iraq war and Guantanamo Bay. I think what this means for journalists is really what it should mean for anything we cover – don’t censor ourselves to try to shape the news, resist sensationalism and report on every angle. Sometimes we can inadvertently glorify figures such as Awlaki – without uncovering the horrors of what he is preaching. On the other end of the spectrum, I think sometimes we hide the ugliness of the war, or not report fully on the mistakes made, such as the human cost to drone attacks based on faulty intelligence. JH: It's been a tough time in many different ways. Looking back now, what effect have these last ten years had on you personally? MS: Like all journalists, sometimes I worry about becoming desensitized because you see so much. That has never seemed to be my problem, however, as I continually get my heart broken. I described myself at the end of the book as a cynical optimist – if that’s possible. For every example I’ve seen of something truly heart-wrenching and depressing, I’ve encountered something so incredibly beautiful and promising. I didn’t write the book as a memoir – some amazing ones have been written recently by journalists – because frankly I’m not that interesting. It’s the people I’ve met over the last decade who are fascinating and my only role is telling their stories. For that I feel so privileged – what an amazing job we have that allows us access almost everywhere. I guess the only struggle is just the pace of the job and inability to plan your life. I adore travel and am so lucky to have spent much of the decade traveling to places few will go and meeting people that will forever stay with me. The flipside though is that sometimes it’s hard to transition from life in hyper-drive abroad to this beautiful home I have here in Toronto. You come back jetlagged, exhausted, in need of good food and there’s guilt that comes home with you too – about what I have here when I’ve just come from a place that has none. I guess I just hope what I report helps the situation of those I have left, and broadens the public’s understanding of the world. And I’m always conscious of not becoming one of those journalists who needs this adrenalin to define themselves and returns home only anxious to plan the next trip. I like home too. It’s a delicate balance and I’m so lucky I have a wonderful, patient husband who’s a journalist who gets it, and parents who deserve some sort of award for their support and putting up with me.